I'm back at work decluttering, pulling fabric and yarn from my craft room. It's like emptying a bucket one drop at a time. Or one cup at a time. You can't see the progress... The bucket still looks full and the bottom of the bucket so far away. At first, it was easy to remove things from the room. 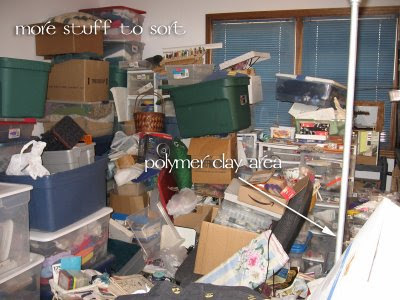 I pulled only the boxes that were all fabric or all yarn. I flipped through the contents very quickly and grabbed one or two things here and there I thought I wanted to keep. The first (20+ boxes) give-away batch of fabric went quickly to Generations of Hope for quilts for the kids, and my sister in law's mom who makes quilts and floor cloths for the poor. It didn't hurt all that much, in fact it felt pretty good. Then I went back in and tried to tackle the boxes that were left, a mixture of fabric, yarn, ribbons, thread, wreaths, dried flowers, and craft items too numerous to mention. The frustrating part of it is that it doesn't look like I took a darn thing out of the room at the moment. I can't reach my polymer clay. And downstairs I have boxes of beads that need to be brought upstairs. Today I dragged a large garbage bag of fabric down the stairs to give away. One more drop of water from the bucket. When ever I think I'm not going to use something so I give it away, I end up needing it late. Really! So I keep it all! Seriously, I need to get rid of some stuff to make room for more stuff. I can so sympathize with you! I have most of my stuff very organized in a craft room and a sewing room but times is always so short that I pull things out to do a needed project and they don't get put away in their proper place and it ends up being a real mess. Sort of hit and run! I am trying so so hard to let go of "things" in my life but it is so difficult. I think growing up without things has made me want to hang on because it won't be that long until retirement and then I will actually use EVERYTHING at some point. Don't give up! The end results is really very satisfying. Even a box a day can be productive! And don't forget, you are definately not alone. We are all out here!